With charms it's ~18.5k, plus another >1k if I put 300 spare points in vitality. It could be much higher, but I haven't tried pushing it because in SP it stops being relevant after a while. I'd only want more life for Laz/Void bosses, not much else can realistically kill me while I'm stuck on p1. Realm would be a better place to test the limits for sure. which gives 40-50% MF and since then I've been able to sit on 175% with normal gear and no jewels/runes. Okay here's some of the differences. Note that I used both helms full with dex gems and checked some basic differences like damage output of Enfilade and HP. 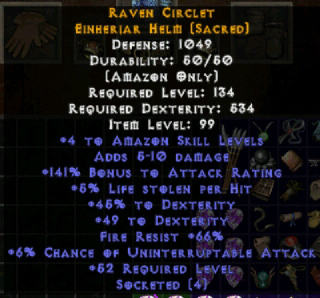 Used a clean Lionblood Crest(failed lucky). Also note that the Lavadome has been MO'd with the most useful stats you can get from vendor like flat dex, vit, dmg, and squeezing in a bit of MF. Nothing less, nothing more. Gives better MO availability that helps achieve minimum frames for things such as block speeds and squeezing a bit of MF. Not much of a difference for other aspects even with the +2 skills affecting key skills like Paragon. Probably better regeneration due to having slight increase in hp(about 100-200hp, in comparison with Lionblood Crest) and adding bits of points to Moonbeam. Higher Attack Rate due to % attributes and thus decent vit increase as well. Higher max resists for Fire and Poison. Rain of Fire proc and even with Fairy Ring if you spam them quite often. Which is basically a wash. If I switched back to Lavadome I'd get life and MO space but lose more damage. Ultimately the big difference is Lionblood's max resists and whether they're really useful or not. 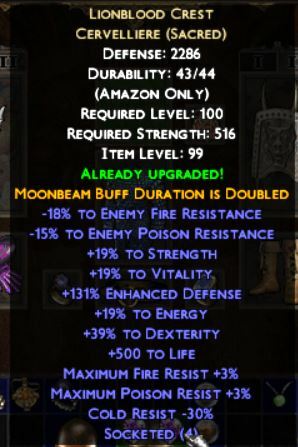 I still don't think the Moonbeam duration does much... it's the difference between 1/30th of your time throwing Moonbeam or 1/60th of your time. There aren't many situations where I'm standing still attacking for more than 10 seconds. Vizjun maybe.
. Crafted Zon shields can roll +1% block and will often be much better than Lion. I'll try to come up with an example. I'll start adding some of this stuff to the guide soonish + mention something about merc gearing. Worth doing if you dont have danmaku? DoctorHellNo wrote: Worth doing if you dont have danmaku? Depends on what you mean by "worth doing". It works fine without it, but it's not going to be competitive with other endgame specs if you're missing key gear. Danmaku is the second most desired item for this build behind a good weapon. Hi, I'm new to Median XL, but a aRPG and D2 veteran of a few thousand hours and you got me confused. I'm just in A4 normal and get absolutely destroyed with Ecstatic Frenzy active. I guess that's to be expected before maxblock, but with 210 dex I'm a looooong way off. The thing is, the build is supposed to kite a bunch of mobs, so potentially you'll get hit by a bunch of mobs if you mess up a bit and I don't see how even maxblock can safe you from stun/block-lock. Not to mention there are a gazillion mobs that teleport into your face or are invisible, or throw stuns. So I guess my question is: when do you use ecstatic frenzy, and how do you deal with stuns and teleporting mobs? Then you got me confused with the skill use. Moonbeam seems needed due to the stong defensive buff to counteract Ecstatic Frenzy. Then you comment the main damage is Enfilade and Fairy Ring. Thing is - I'm supposed to kite stuff, so there are only intervals at which I can attack. Keeping a (at the moment) 2.8s Buff up while doing that seems borderline impossible and requires kinda open areas anyway. Especially as long as locks and stuns are an issue. Close corners, for example on the way to Mephisto are especially problematic - maybe I should specc and use Ricochet there. Buchsbaum wrote: Hi, I'm new to Median XL, but a aRPG and D2 veteran of a few thousand hours and you got me confused. As you are new you really shouldn't use EF at the beginning, dmg gain is pitiful at low lvls and attack speed is meh as Fairy Ring does most of the killing. Get Tier 3 Setzschild and you can walk through norm and NM, later when you are more familiar with the mobs you can switch to more faster and glass-cannony build. If you've been keeping up with your weapon upgrades you should be able to kill most everything in 1-2 Enfilades which is why the EF attack speed is useful; it lets you chew through stuff before it reaches you. Turning EF off will make this nigh-impossible to do and you'll rely on FR crawling a lot more. I agree that if you're not familiar with which monsters to prioritise/which can kill you it could be worth playing it safer; A4 is a difficulty spike with several big threats (Heretics, Troupers, Firebloods) and in normal your defense will still be relevant. But ultimately it's just a matter of recognising what's what and how you should behave. Moonbeam duration can definitely be an issue early on. I keep it on left click and tap shift, alternating it with my other skill. Also make sure you're using your summons to mitigate damage, you can always bait with them if you're not sure how to advance. Obviously Moonbeam is not useful if you just kill everything before it can hit you. Props on putting up with getting this build to level 18 as a new player by the way, it has an incredibly painful first few levels by Median standards. By where you are now the worst part is long over. itsme wrote: Props on putting up with getting this build to level 18 as a new player by the way, it has an incredibly painful first few levels by Median standards. By where you are now the worst part is long over. My main issues came from enjoying that too much and playing with Moonbeam for too long, if anything. Sadly the Enfilade / Fairy Ring playstyle isn't what I was expecting from a "Java". 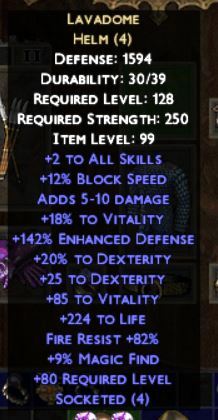 have you tried using charged strike oskill as single-target? and does it provide viable single-target dps?